Lindelof teases former Manchester United team mate after scoring for Sweden. Watch out: After scoring the second goal for Sweden, Lindelof issued a light-hearted warning for LA Galaxy star. Victor Lindelof issued his former Manchester United team-mate Zlatan Ibrahimovic a light-hearted warning after scoring just his second international goal on Tuesday night. Sweden has a new soccer star. After winning Sweden’s Player of the Year award for 10 consecutive years, Ibrahimovic was pushed aside last week by Victor Lindelof, who won the individual award after a stellar World Cup and cementing himself in the heart of Manchester United’s defense. 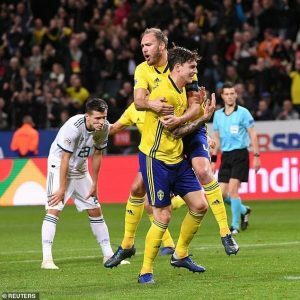 The Manchester United defender, named best player at Sweden’s annual football awards last week, rattled home Mikael Lustig’s knock-down from a corner to give his side the lead against Russia in Stockholm. 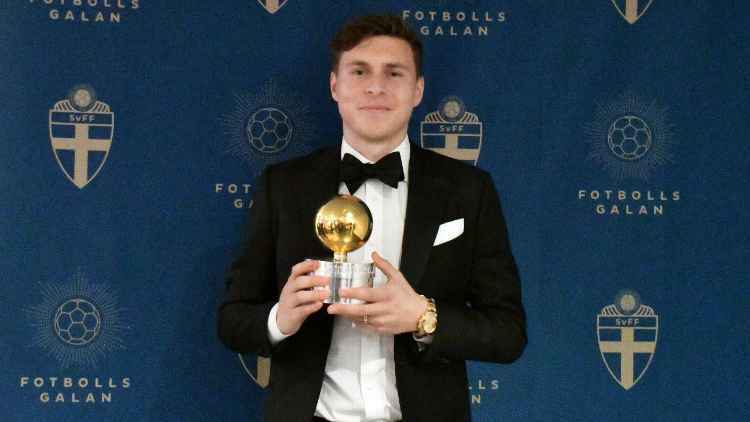 It means a lot to me, “I’m incredibly proud,” Lindelof told newspaper Aftonbladet, which awards the prize. “It’s an award that I grew up with and watched on TV when Zlatan stood there year after year. It’s huge, and it’s still hard to comprehend”. And the 24-year-old couldn’t help but poke fun at his countryman. Just another 497 of those and the centre-back will have caught up to Ibrahimovic’s 505 career goals. Lindelof sent a playful message to the imposing striker, who retired from international football in 2016, on Twitter. Lindelof tagged Ibrahimovic in a tweet saying ‘Watch out‘ alongside a picture of him celebrating his goal. Ibrahimovic, who is currently playing for LA Galaxy in the MLS, replied with ‘I told you it’s easy! Let’s go’. The former Benfica man’s goal means he is now just 61 international goals behind Ibrahimovic, who is still Sweden’s all-time top scorer with 61 goals in 116 appearances. The Manchester United centre-back has come into form under Jose Mourinho last season and has become a pivotal part for his national team. But in order to break the records of Zlatan Ibrahimovic, the ultimate goalscorer, he still has plenty of areas to develop over the next five years.